For the past week, we have had abnormally warm weather. Yesterday and the day before it reached the 80s and we broke the record temperatures. Not going to lie, it's been awesome. With this heat wave, spring has sprung. Daffodils are blooming, the leaves on the trees are starting to burst, and as of today, the lilacs are starting as well. I'm crossing my fingers that we don't get some random snow storm, although that wouldn't really surprise me because it has happened in the past. Early Spring combined with being able to open my blue polish after many months, I decided it was time for a Spring time manicure to kick off the season. And what better way than with flowers?? Surprisingly, this was not a time consuming mani. I painted the base on first, then did a sloppy french tip sort of thing with the green brush. It didn't have to be perfect because grass is not even and perfect. 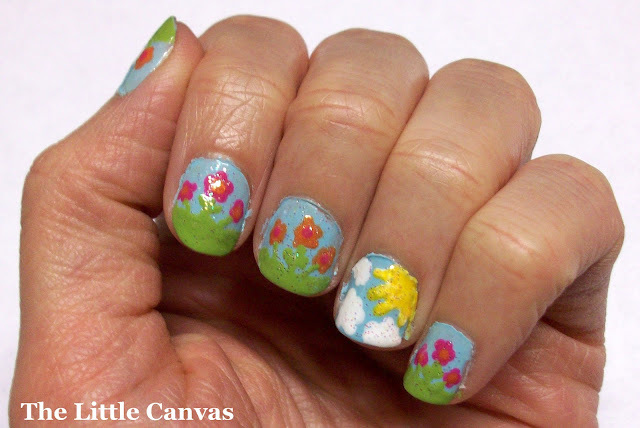 Next, with my dotting tool, I dotted on the flowers, clouds, and sun. With a tooth pick, I added the stems and the sun rays. Finished it all off with a quick coat of New York Color White Lights glitter. I think it took probably a half hour to get both hands done. 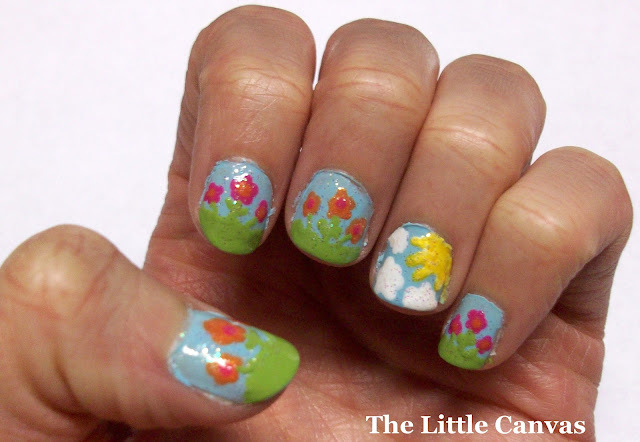 After doing this manicure, I thought of a perfect Easter one which I cannot way to do and show everyone! Where ever you all are, I hope you are enjoying this amazing weather!! !